North Carolina Democratic Gov. Roy Cooper's leadership amid the devastation won widespread praise, including some from Republican politicians who have been passing laws to undercut him ever since he was elected. RALEIGH, N.C. (AP) — As Hurricane Florence was thrashing North Carolina earlier this month, Democratic Gov. Roy Cooper’s leadership amid the devastation won widespread praise, including some from Republican politicians who have been passing laws to undercut him ever since he was elected. 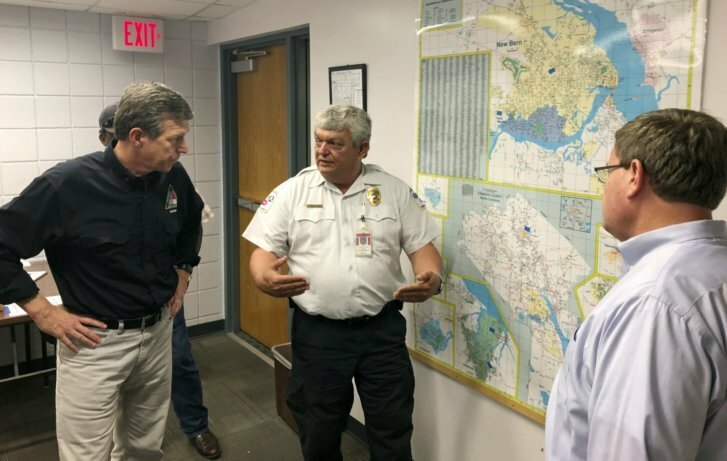 He offered encouragement and warnings to the public in daily news conferences, visited evacuees in shelters and traveled with Republican House Speaker Tim Moore in New Bern to view storm damage. But that was then — and as the immediate crisis gives way to rebuilding, with a key election just weeks away, the temptation to revive partisan rancor will grow. The first significant test comes this week when lawmakers reconvene a special session Cooper called to address initial needs from Florence. The session resumes exactly five weeks before an Election Day in which all 170 legislative seats are on the ballot. Cooper, who doesn’t face re-election until 2020, and Democratic allies have invested millions of dollars toward ending the GOP’s veto-proof majorities and giving the governor more leverage on his education, public school and environmental policy goals. House Majority Leader John Bell of Wayne County said he’s been too busy responding to needs of constituents and family since Florence to think about election-year politics. Bell praised Cooper for his actions during the storm but added “now we’re starting the recovery and that’s a whole ‘nother ball game. '” He’s hopeful that the legislature and Cooper don’t get “into a battle of dollars,” with the Cooper administration over recovery funds. For now, Republicans and Cooper sound committed to focusing on recovery, even as the elections approach. Florence dumped over 30 inches (0.76 meters) of rain in parts of eastern North Carolina in mid-September, leading to more than three dozen deaths. Tens of thousands of buildings were damaged and thousands of people are without livable homes. Cooper’s office estimates total damage will be at least twice the $4.9 billion caused by Hurricane Matthew in October 2016. State government will surely pay more than the $361 million it’s done for Matthew. The storm-spawned unity among North Carolina political leaders contrasts with the past two years of hostility since Cooper narrowly defeated GOP Gov. Pat McCrory. Republicans have worked at nearly every turn to diminish Cooper’s powers, starting the effort just after a special session to address Matthew relief about two weeks before he was sworn in. The governor has been in court ever since fighting those Republican efforts, with mixed results. Of the record 25 vetoes he’s already issued, the legislature has overridden 20 of them. The underlying conflict between Cooper and GOP lawmakers may inevitably re-emerge. Elected leaders on both sides want to demonstrate they’re working for the voters. “It’s unseemly to look political now, but ducks have got to swim, politicians have got to be political,” said Gary Pearce, a longtime adviser to former four-term Democratic Gov. Jim Hunt, who served during hurricane Fran in 1996 and Floyd in 1999. Before Florence, Republicans tried to make the Cooper administration’s handling of federal funds for Matthew relief a campaign issue in legislative districts where residents are still awaiting housing aid. Cooper hasn’t yet provided publicly a detailed post-Florence wish list with a price tag, but said long-term recovery would focus on rebuilding “stronger and smarter.” That includes more affordable housing, state programs to help raise or relocate homes out of flood plains and assist people with paying for flood insurance, he said. Meanwhile, Republicans have been talking up a record $2 billion “rainy-day fund” they’ve been accumulating since taking office for just such a storm. They’ve already avoided early conflict. Initially Cooper set the session for Oct. 9, but Moore and Senate leader Phil Berger wanted it moved up. Lawmakers could have called themselves back on their own schedule, slighting Cooper, but instead they compromised. GOP lawmakers would be wise not to fight Cooper now because they’re on the November ballot and he isn’t, political science professor David McLennan at Meredith College in Raleigh. “They don’t want to come across as being insensitive to the needs of North Carolina’s people,” McLennan said.